The BikeBoard is a pioneering a new category of wheeled recreational products. 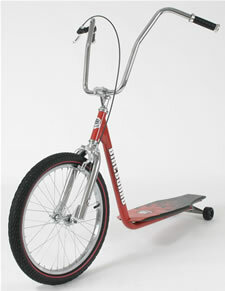 It functions similar to a scooter but maneuvers like a surfboard, snowboard, skateboard or BMX bike. Three models fit different aged users: the Tyke model for ages 4 and up, the Mini for ages 7 and up, and the Cruiser & Freestyle for ages 10 and up. The design team created a frame that acts as a lever to flex the rear suspension for amazing maneuverability. It is easy to assemble, and learning to ride it is simple.